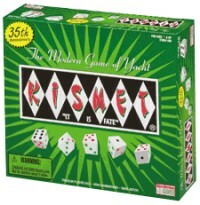 Kismet is the high-energy, fast-paced dice game that pits chance against strategy! Five tri-colored dice increase the odds and keep the game challenging. Try your luck ... or is it fate? You take the cup in hand and give it a shake. Five colored dice spill across the table. Combine the dice into various combinations according to number and color. Originally released in 1964, this game is similar to Yahtzee, billing itself as "The Modern Game Of Yacht". It uses many of the same scoring combinations as Yahtzee, some using color as well as pip values. This adds a new element of strategy to the game, and increases the challenge (see complete Kismet Rules). If you're becoming bored with plain old Yahtzee, give Kismet a try! And don't forget to buy some extra score sheets – Kismet comes with a good supply, but as addictive as this game is, you'll fill them up in no time!